Explanation: The night had no moon, but the stars were out. And camped at 16,000 feet on Mt. Kilimanjaro, photographer Dan Heller recorded this marvelous 3 1/2 hour long exposure. Here the landscape is lit mostly by the stars. Flashlights give the tents an erie internal radiance while the greenish glow from the distant city lights of Moshi, Tanzania filter through the clouds below. 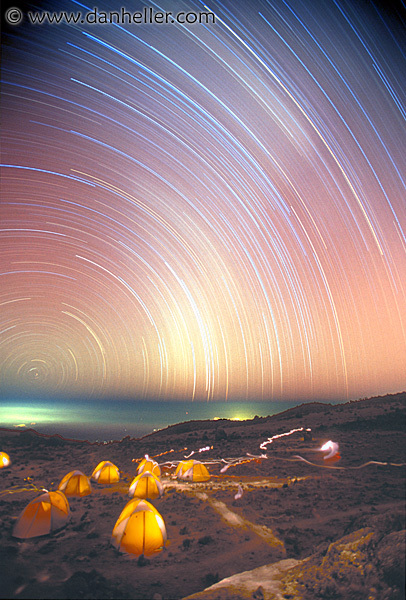 The view from this famous equatorial African mountain is toward the south, putting the South Celestial Pole close to the horizon on the far left, near the center of the graceful concentric star trail arcs. In the thin air and clear dark skies, even the ghostly Milky Way left a faint triangular glow as it swept across the middle of the dreamlike scene.